Working to ban horse slaughter in Canada. On November 8th, the CHDC filed official complaints to the CFIA and Transport Canada with respect to the transport of slaughter-bound horses via air cargo through our legal counsel MW Law Offices of Vancouver, BC. In his complaint to the CFIA and the Superintendent of Aviation Enforcement at Transport Canada, our counsel, Nicholas Weigelt, details the violations of the Health of Animals Act pertaining to horses being unable to stand in a natural position and lack of segregation of horses over 14 hands high. Also, in the complaint to Transport Canada, the risks of shipping large draft horses in breakable, confined crates is brought to the attention of the agency. These complaints are filed subsequent to the CHDC’s news release of October 18, 2012 “CFIA Fails Again at Enforcing Regulations for Live Horse Exports to Japan” announcing that video footage was captured of draft horses being loaded and shipped from Calgary International Airport for live shipment to Japan. Please read the complaint to the CFIA here and Transport Canada here. CHDC supporters are asked to write courteous letters to the CFIA and Transport Canada to help bring this matter to further attention. I am watching the horses get loaded onto the plane as I type this. I hate it and wondered if anyone else cared about these horses, which is why I came across this site. Hi, Sarah. Figured out how to do it! The key to this whole issue of Horse slaughter, is Radio, TV,,Twitter ,Facebook, Billboard and Print Media. Simply put, , as orginazitions greater efforts need to be directed at fund raising, it is the only way we are going to REACH THE PUBLIC in greater numbers. A majority of people i talk with are astounded that ANY govt. would support the killing of Horses. AND THIS CONSERATIVE GOVT. WANTS TO KEEP IT THIS WAY. Just sent letters off to all the addresses but the one for Jim Welwood at Tranport Canada has already come back as undeliverable, wrong address. 😦 it was a good letter too. Any new address ideas? I have written George Shaw CFIA Public Relations, inquiring as to whether the Horse slaughter plant in Quebec, where video CONFIRMED animal cruelty is now using a firearm to kill Horses. Ihave further asked whether a CFIA Vet is placed in the kill box area to CONFIRM HUMANE KILLING when ever these animals are shot. Ihave also written George Shaw asking what measures[ PUNATIVE] are being taken over very large Horses being confined in crates where they were not able to stand upright for a VERY LONG DURATION OF TIME. Considering a disturbing history of the CFIA incapble of enforcing their OWN REGULATIONS,perhaps animal transport and humane slaughter should be severed from CFIA responsibility and assigned to a transparent, credible body that is arms length from Ritz and the CFIA. Emailed everyone and received no replies. Not really a surprize! 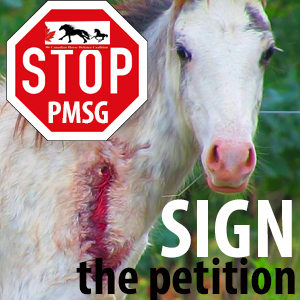 Please Help Us Stop Horse Blood Farms! You can support our fight against horse slaughter by purchasing from our Cafepress shop. Lots to choose from! Please note: If you with to submit material to us please do, but remember to include a letter explaining why you are submitting it. Disclaimer The Canadian Horse Defence Coalition (CHDC) is not responsible, nor will be held liable, for any statement entered by any person on our Blog and/or Facebook page or in the Blog/Facebook comments section, nor the laws which they may break in our country or theirs through comments' content, implication, and intent. Opinions expressed are not necessarily the opinions of the CHDC.